Today, the Petroleum Services Association of Canada (PSAC) and JWN announce the launch of the 2017 PSAC Well Cost Study in a new digitized format, offering users a fully customizable database to compare well costs in more than 150 categories. The new study is powered by Canoils, a leading provider of financial and asset-level oil and gas data for the Canadian market. The PSAC data neatly complements the existing information found within Canoils’ database. Prices for the 2017 PSAC Well Cost Study data start at $3,500. Discounts are available for PSAC members. For more information, click here. For more than 75 years, JWN has provided trusted energy intelligence. Our energy professionals provide the information, insight and analysis organizations need to stay informed and understand what’s happening in the energy industry. JWN provides a range of products and services to help companies gain the insights they need to stay competitive including industry and company benchmarking, custom data sets, market intelligence, custom intelligence and outlook reports, integrated marketing solutions, and events and conferences. JWN’s flagship products include the Daily Oil Bulletin (DOB), Oilweek and the Comprehensive Oilfield Service and Supply Directory (COSSD). New tools have been developed to help Canadian oil and gas producers measure more easily the impact of LLR regulations on well operations and potential asset deals. Recent changes in Alberta to how the Licensee Liability Rating is applied bring into focus the importance of these regulations in an economy where assets may be under threat. You’re likely aware that LLR programs ensure costs to suspend, abandon, remediate or reclaim a well, facility or pipelines are not borne by the public if a licensee becomes defunct. To fulfill LLR regulations, the value of an operator’s ongoing assets must outweigh any abandonment/reclamation costs. We’re using a new tool that allows us to quickly calculate the LLR for individual and clusters of wells. The CanOils Assets LLR data, a new standard addition to every CanOils Assets subscription, also allows us to easily measure how a potential asset purchase or sale could alter a company’s LLR position. CanOils Assets LLR data includes deemed assets and liability estimates for wells in Alberta, Saskatchewan and British Columbia. This degree of data transparency is excellent for business development and the service and supply sector. We’ve been using the data for pro-forma analysis of M&A transactions and to identify companies in need of abandonment or reclamation services. 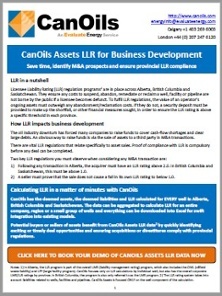 For a more detailed look at how the CanOils Assets LLR data can benefit business development, click here for a short case study, which includes pre- and post-transaction LLR estimates for Canada’s biggest deal of 2016. We’ve also been reviewing the CanOils Corporate LMR Summary module. This module delivers the LMR ratio for all companies as reported by each provincial regulator (AB, SK, BC). For SK, this includes the value of any security deposits provided. Importantly from a business development perspective, the tool can help us find companies whose LMR ratios may be problematic. We’ve found this data especially useful in conjunction with our regular financial reporting. To learn more, click here. Dramatic shifts have taken place in the way U.S. oil and gas operators view cash flow, capital expenditure (cap-ex) and market risk – with companies closer today to being able to fund cap-ex plans with only their operating cash flow than at any point since the price downturn began. U.S. oil and gas companies spent 57% less in cap-ex in Q2 2016 compared to the end of 2014 on a rolling 12 month basis – and this is finally having a material impact on production. 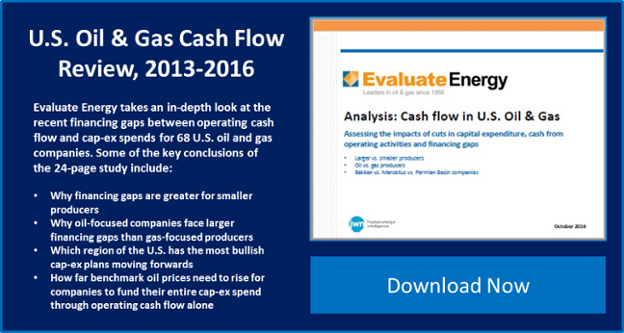 That is one of the key findings of a far-reaching study of cash flow trends for 68 U.S. oil and gas companies by Evaluate Energy. The study examines the size of the financing gap that exists between a company’s operating cash flow and its cap-ex spending. This gap varies very significantly, depending on the size of company and location of its production, and this large cut in cap-ex is undoubtedly a key driver of falling financing gaps in more recent periods. The size of the internal financing gap is crucial, not least because it determines how far each company is able to fund cap-ex via after-tax profits and conversely its level of reliance upon external cash to fund development plans. It also provides a gauge of company confidence – and, crucially, it points to how far benchmark prices would need to rise to ensure a company could entirely fund cap-ex using just operating cash flow. 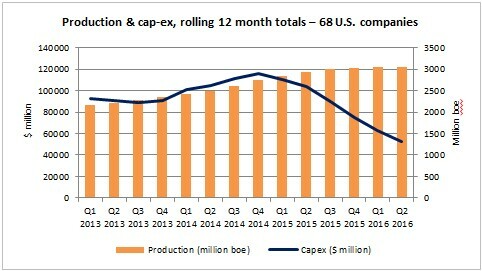 The sharp cut off in cap-ex over the past two years is finally starting to bite on production. Cap-ex has been cut across the board since the end of 2014. While production trended upward from 2013 for a few quarters into 2015, we are now starting to see the rate of growth decline. While Q2 2016 production is around 40% higher than Q1 2013, it is similar to Q1 2016. The Evaluate Energy study provides analysis on pricing per region based on an analysis of 68 representative U.S. oil and gas companies within its coverage of all U.S. stock exchange-listed operators. Click here to read the full report, which also studies the varying financing gaps between Bakken, Marcellus and Permian Basin producers. Europe will play a pivotal role in the performance of LNG markets globally amid ongoing concerns over gas over-supply, reduced demand in some quarters and pressure on prices. The major question remains the extent to which Europe can absorb increased gas volumes as part of goals to de-carbonize economies, promote renewables, ensure pricing remain competitive, safeguard energy security and deliver diversity of supply. Monika Zsigri, an energy policy officer with the European Commission, confirmed that as EU domestic gas production decreased, net EU gas imports increased by 11% last year. LNG shipments bound for Europe rose 6%, as did LNG’s share of the imported gas mix, to 13%. Qatar remains the largest supplier of LNG to Europe, with a 56% market share, followed by Algeria and Nigeria. While the direct impact of U.S. LNG has not been significant in Europe, it is putting downward pressure on prices. “There is a lot of gas in the market, and the market is fairly flat in Asia,” Zsigri said at the LNGgc Conference in London this week. 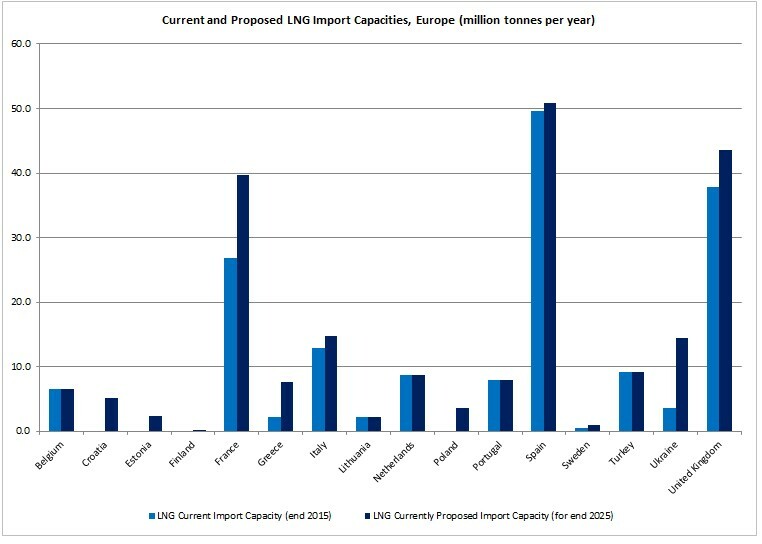 LNG import capacities are set to increase dramatically in several European countries by 2025, notably in the United Kingdom, France, Ukraine, Poland, Greece and Croatia, according to Evaluate Energy data. Costanza Jacazio, a senior gas analyst at the International Energy Authority, expects demand to stabilize in Europe followed by a gradual recovery due in part to retiring coal and nuclear plants. But she said the global rebalancing of markets would depend on the pace of expansion in China, together with other developing Asian nations. 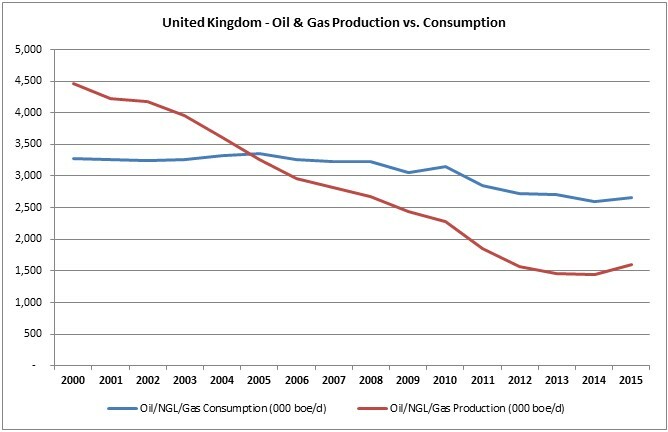 Carmen Lopez-Contreras, a senior analyst on Repsol’s gas and power team, said declining European power production (for example in the United Kingdom and the Netherlands) and the need to retain gas supplies while countries adopt more renewable energy solutions will bolster gas demand. Pricing, volume and destination flexibility will be high on the agenda for buyers facing greater uncertainty and volatility in demand. “It is very likely markets will struggle to absorb incremental supplies,” said Armelle Lecarpentier, chief economist, CEDIGAZ, the international association for natural gas. She believes the United States is on track to take the role of swing supplier, adding that the trajectory of global gas markets, and the pace of any market rebalancing, will rest strongly on demand in China and developing Asian nations. She sees this flexible LNG going to new importers in South East Asia, South Asia, North Africa and Latin America. She feels the rise of renewables and increased energy efficiency will temper additional European demand. 1) Proposed import capacity for end 2025 is calculated assuming that all currently active import terminals remain in operation and all proposed projects, regardless of current status, reach completion at their respectively scheduled onstream dates. 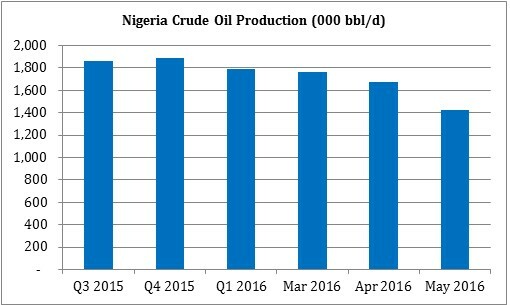 Oil production has fallen dramatically and acquisition deals have ground to a virtual halt so far in 2016 in Nigeria, as the country continues to grapple with militant attacks on energy installations. The concerns over export levels centre on oil installations in the Niger Delta that have been repeatedly targeted in recent months, creating significant unrest and threatening oil export volumes. It hardly needs stating that energy production and exports are absolutely pivotal to the health of the economy of Nigeria, where several major international operators have significant stakes. Glacier Media’s Evaluate Energy data indicates that ExxonMobil produced 297,000 barrels a day (b/d), Royal Dutch Shell 275,000 b/d, Chevron 271,000 b/d, Total 228,000 b/d, and ENI SpA 132,000 b/d during 2015. Crude oil production within the troubled West African state has plummeted during the first half of 2016. In May alone, output had fallen by 461,000 b/d when compared to fourth quarter averages in 2015, to 1.42 million b/d. May production was down 251,000 b/d compared to April as the slide continued, according to OPEC’s report on crude oil production from secondary sources. Among Africa’s OPEC-member nations, the same OPEC data indicates Nigeria lagged behind Angola in terms of year-to-date crude oil production to May. Our Evaluate Energy data indicates that oil exports from Nigeria topped out in 2010 at 2.25 million b/d. 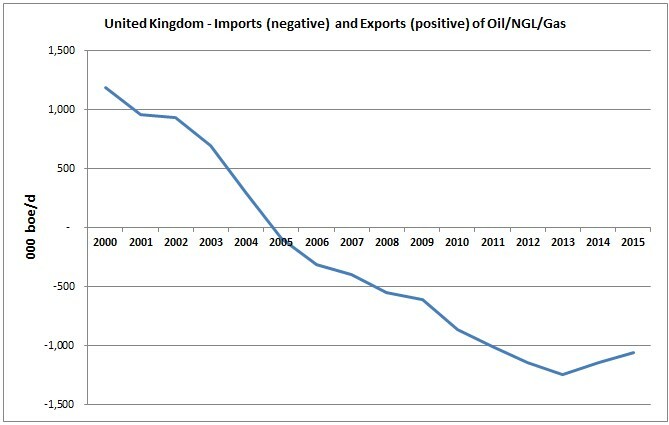 With the exception of a small increase in 2014, exports have fallen every year since 2010, and stood at just over 2 million barrels in 2015. As market uncertainty prevails in Nigeria, merger and acquisition activity has fallen dramatically. According to our 2016 data, so far this year just two deals have been announced. That compares to 13 deals announced in each of the two years prior. The larger of the two deals in 2016 involved Canadian-listed Mart Resources Inc. (TSX: MMT), which agreed a Cdn$367 million deal (including debt) to be acquired by Midwestern Oil & Gas Company Ltd. and San Leon Energy Plc. The second Nigerian M&A deal so far this year saw MX Oil plc acquired by GEC Petroleum Development Co. Ltd. for US$18 million. While efforts are made to tackle the disruption, markets will watch on in hope of a resolution. As a side note, a Nigerian, Dr. Mohammed Sanusi Barkindo, takes the helm as secretary general of OPEC next month: http://www.opec.org/opec_web/en/press_room/3529.htm. Dr. Barkindo is formerly a managing director of state enterprise the Nigerian National Petroleum Corp.
Offshore oil production in Norway flowed as usual today after strike action by workers was averted. Norway’s net oil exports in 2015 averaged 1.714 million barrels a day, an increase of 58,000 barrels compared to 2014, according to data from Evaluate Energy and the BP Statistical Review of 2015. The majority-state-owned Statoil (Oslo:STL) is by far the country’s biggest oil and gas producer, with 1.23 million boe/d. 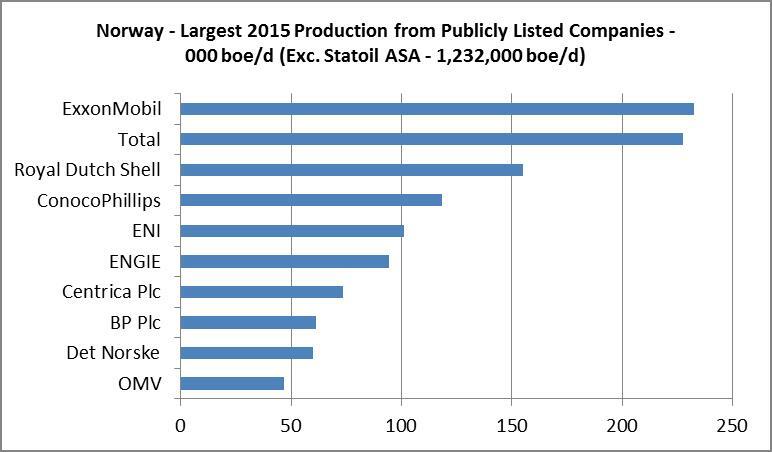 The second largest producer is ExxonMobil (NYSE:XOM) at 233,000 boe/d followed by Total (Paris:FP) at 227,000 boe/d. 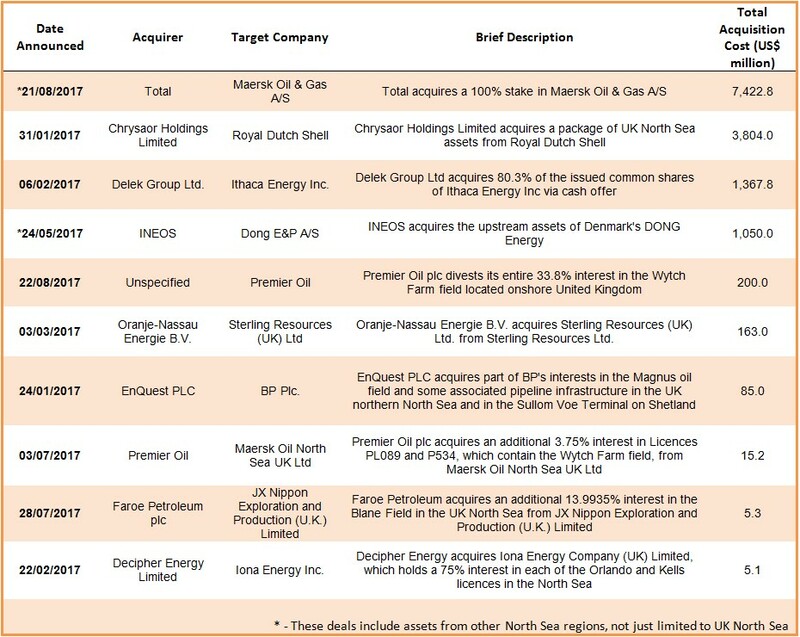 Royal Dutch Shell (LSE:RDSA), ConocoPhillips (NYSE:COP), ENI (Milan:ENI), ENGIE (Paris:ENGI), Centrica Plc (LSE:CNA), BP (LSE:BP) and Det Norske (Oslo:DETNOR) are also in the top 10. About 7,500 employees working in Norway’s offshore oil fields as either drilling personnel or in catering are covered by a new offshore pay settlement, according to the Norwegian Oil and Gas Association in a weekend statement. The Association said the deal was reached between the Norwegian Union of Industry and Energy Workers (Industry Energy), the Norwegian Union of Energy Workers (Safe) and the Norwegian Organization of Managers and Executives. “These negotiations have been demanding, with a number of different issues which had to be resolved,” said Jan Hodneland, lead negotiator for Norwegian Oil and Gas. Need to keep in touch with the oil and gas industry in any country worldwide? The Evaluate Energy country subscription helps you do just that.